This one-day workshop is designed for students with some watercolor experience. Stacy will be demonstrating negative painting of a flower. 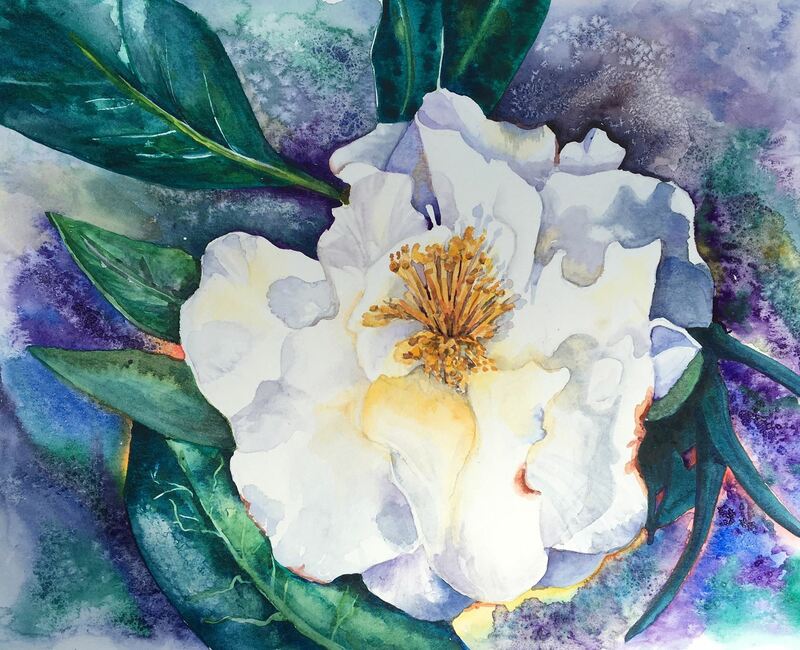 Stacy Lund Levy, owner of Lund Art Studios, has turned her medical illustrations talents to watercolor painting and multi-media works of art. Stacy will be doing a demonstration of a flower similar to the one shown at the top of the page. 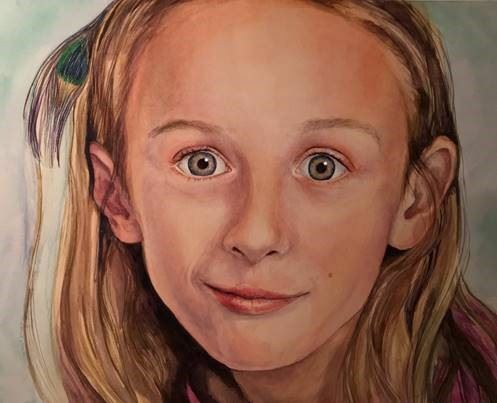 For the finished painting, you will either work from your own reference photo of a flower, or you can work from one Stacy will provide similar to the one used for the demonstration. You will be shown a method to transfer a tracing of the image onto the watercolor paper (using a printed template of the image and graphite transfer paper). Your finished painting will be either a quarter sheet or half sheet size (11x15” or 15x22”). 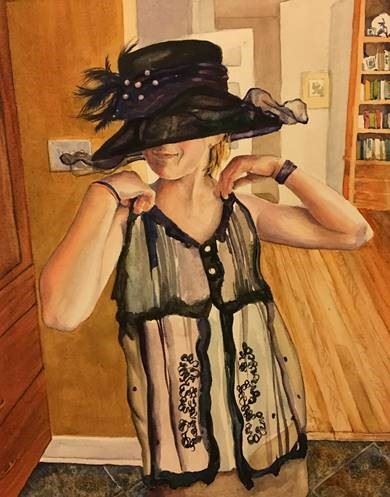 Born in Baltimore, Maryland, Stacy has always been interested in art and science, and combined the two interests to complete a degree in medical and biological illustration at the Johns Hopkins Art as Applied to Medicine program. She worked as a medical illustrator until she decided that she would like to depict the subjects of her paintings and sculptures without all the extra information contained in the internal organs and structures. 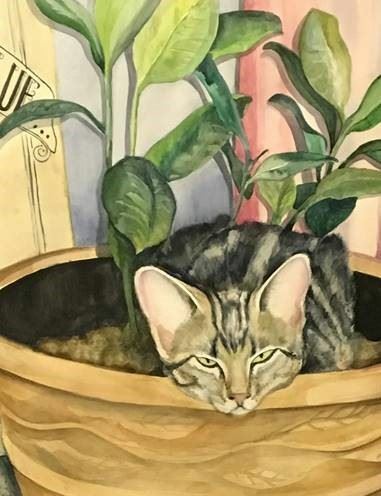 Now she paints flowers, portraits, landscapes, and animals. Currently she teaches classes at Carroll Community College and North Carroll Senior Center, and is enjoying creating her art free of publishing deadlines. My work is based on the “measure twice, cut once” approach. Sometimes this actually works. For me, any art project has infinite opportunities and possibilities within the raw materials being used. I loved my early art training, which was fairly formal, and based mainly on the use of traditional media. As simple as it might sound, no matter what I am working on, I always start with the basics. I think first about the practical aspects: are my materials suitable for the job, how will it age, will it hold up in shipping or transport? I try to think about the “bones” of the piece before anything else. My art gives me happiness and satisfaction mainly in the process of its creation. To me, creating any art is a continuous series of mini puzzles that need solutions. As I am working, I am asking myself a series of questions, starting with, how will this work? I continually look for “clues” in my subject. What supports the object or being? The weight is centered where? How is it connected? To what? How is it held up? From what? Is it floating? Is it flying or being pressed down? What colors will convey the feeling I want to convey? I continue to work through these steps until I am satisfied. If I have answered all the questions, and solved all the puzzles, the result is tremendously satisfying for me and hopefully the viewer. Participants will need to bring their usual watercolor supplies. A list of supplies will be supplied to all registrants. From the Baltimore Beltway (I695) take the exit onto I-70W and follow for 4.4 miles. Take exit 87B to merge onto US-29N towards MD99. Turn right at Rogers Ave. At the traffic light, take the exit to stay straight on Rogers Ave. Turn left at High Ridge Rd. and the Howard Co. Center for the Arts is on the left. Registration Deadline: September 17th unless the program is full prior to this date. Cancelation: 75% refund if notified no later than September 17th 2016 Refunds for later cancellations are subject to availability of a substitute participant.